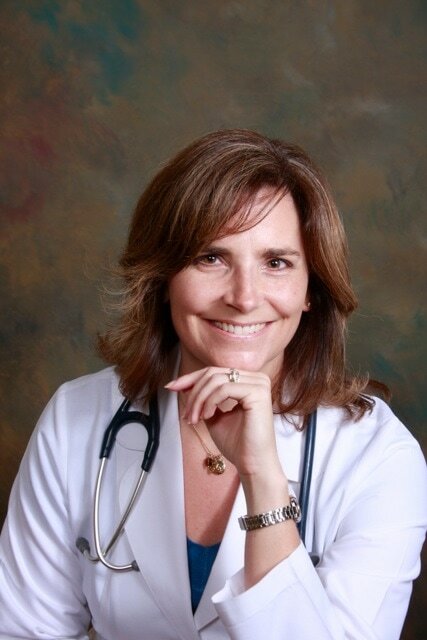 I am a family physician, wife, mom and veteran. I have been practicing medicine since 1999 when I received my M.D. in Bethesda, Maryland. I enjoy the full spectrum of family medicine to include care for younger and older adults, teens, children and infants. I enjoy men’s and women's health, gynecology, acute care, sports medicine, behavioral health and office procedures (from stitches to joint injections). I have special interests and experience in adolescent medicine, contraceptive procedures (to include IUDs and implants), and HIV medicine. ​I served as a physician in the USAF for nine years, practicing outpatient, hospital, obstetric, emergency and deployed medicine during that time. I was also on the teaching faculty at Eglin AFB Family Medicine Residency and at the Uniformed Services University's School of Medicine. After separating from the Air Force, I continued practicing medicine in varied settings as I followed my husband from state to state until his own retirement from the USAF in 2015. Those varied settings included providing medical care for the un- and under-insured, HIV medicine, public health work, prison medicine, rural hospital medicine, a hospice medical directorship, employment in a privately-owned practice, work in a hospital-owned practice, and work in a direct primary care (DPC) clinic called PeakMed. In 2017, I finally opened my own clinic in my own community so that I could be a doctor not only for families, but also a doctor for the local community. In that vein, I love speaking at our local schools, helping high schoolers with their capstone projects, and serving on the Board of Directors at our Tri-lakes YMCA. I also enjoy being active in our Tri-lakes Chamber of Commerce and serving on D38's Colorado Preschool Program (CPP) Advisory Council. In 2018, I decided to seek an active appointment as Assistant Clinical Professor for the University of Colorado's School of Medicine. I am so glad that CU School of Medicine now has a UCCS Branch. Approximately 24 students from each class in Denver now do the bulk of their rotations in and around Colorado Springs. Having local medical schools is very important for the future of El Paso County. A high percentage of physicians who train in a given area tend to remain local after graduation or tend to come back to their roots later in their careers. With our growing population, recruiting more physicians to our county is a significant need. Having medical schools also increases the overall quality of medical care in a local geographic area over time. As a CU-SOM assistant clinical professor, I now host medical students who rotate with me one half-day a week, 40 weeks a year. My patients and I enjoy helping medical students gain an appreciation for the beautiful specialty of family medicine. In my clinic, I try to introduce students to primary care as it was meant to be... relationship-based, not production-based. I hope to show students and residents that there are alternatives to "assembly-line medicine". ​From my past and current work in all of these settings, I have gained insight into many of the issues surrounding access to affordable primary care in our nation. I have lived and practiced in the Monument/Colorado Springs area since 2012 and we have chosen to settle here near our alma mater, the US Air Force Academy. I am ready to have my own clinic that cultivates a sense of community and where my patients have time to personally connect with me. My husband and I have two children in D38. Our family enjoys supporting Air Force Academy athletics, being active at Cathedral Rock Church and living the mountain lifestyle.